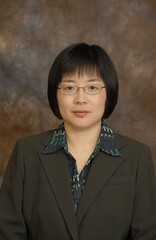 Dr. Dongmei "Maggie" Chen joined the University of Texas, Austin in January 2009. She received her Ph.D. in mechanical engineering from The University of Michigan in 2006. Before joining The University of Texas at Austin, she was with the General Motors Fuel Cell Activities Center. Dr. Chen's teaching and research area is dynamic systems and controls. She is an expert in automotive transmission, vehicle dynamics, and the PEM fuel cell system. Her current research focuses on non-linear control theory and its application in electrical vehicle and alternative energy systems, including the modeling and control of fuel cells, rechargeable batteries, and integrated wind turbine systems. Dr. Chen received a CAREER award from the National Science Foundation (NSF) in 2011 for her work on control of integrated wind turbine and rechargeable battery system. She received the University of Michigan Rackham Graduate School Fellowship from 2000-2005. She was a recipient of the General Motors Powertrain Achievement Award in the Quest for Technical Excellence and a company-wide nominee for Ford Customer Driven Quality Award.